I often take my home and my family for granted. It is such a blessing to have children and raise them up for the Lord. In our homes, the domestic church, we learn everything we need for life. Thank God for your family today! This is a really enjoyable book. 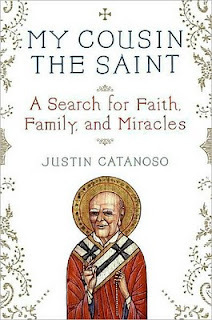 The book is written by Justin Catanoso, a modern day, 40 something, fallen away Catholic. His life is changed when he learns of his grandfather's cousin in Italy who is being investigated for sainthood. The story of the life of now Saint Gaetano Catanoso is told concurrently with the story of Justin's grandfather and his immigration to the United States in the early 1900s. The joys and sorrows of the American Catanoso family is contrasted with the Italian cousins Justin meets when he travels to Italy to learn more about Padre Gaetano Catanoso. All along, Justin's own faith journey is revealed. I like every level of this book. I liked learning about a newly canonized saint. I like reading the story of an immigrant Italian family. And of course I always enjoy reading how God is working in the lives of ordinary people, like this author. I first heard about this book from the Bishop of St. Petersburg FL, Robert N. Lynch. He too enjoyed the book and wrote about it in his blog. You can read his "review" at Bishop Robert Lynch's blog. 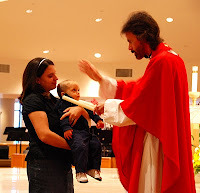 Today we celebrate the feast of St. Blaise who died in 316. Not a whole lot is known about his life, but we believe that even as he was on his way to martyrdom, he was so "other centered" that he stopped and healed a boy who was choking. And so to this day, we honor his memory with the blessing of the throats. As Fr. Tim Sherwood pointed out today at mass, the blessing is not like "magic" or a "lucky rabbits foot" but the grace of God coming down into our lives. Be sure to get your throat blessed today. The time you give our Lord to be at mass and get the blessing, will be a blessing of itself! While we get our throats blessed, let us remember to pray for all those suffering from colds, flu, and other illnesses. Give someone who is home bound a call to day and cheer them up! February 2, the church celebrates the Feast of the Presentation of the Lord in the Temple. Another name for this feast is Candlemas. Forty days after the birth of Jesus, Our Lady presented herself in the temple to be made ritually clean and Jesus was presented in the temple as the first born and offered to the Lord. Simeon and Anna were present. The Holy Family was so poor they gave the smallest sacrifice, a pair of turtle doves. Simeon took Jesus in his arms and declared Him Savior, Light of the Gentiles and the Glory of Israel. He told Mary a sword would pierce her heart! Most parishes bless the candles on this day at mass. A lit candle is a symbol of Jesus, the Light of the World. This is a great Catholic feast day to celebrate at home too. Gather all the candles you can find especially the baptismal candles and put them on the dining room table. Then turn off the lights and slowly light one candle at a time. The Light does dispel the darkness and the children will love it! It is also a great day to pray the fourth joyful mystery. If you have 10 candles you can light one for each Hail Mary and help keep the younger children engaged.